30th September, Taichung: The 19th edition of the Asian School Tenpin Bowling Championships will be hosted by Chinese Taipei for the first time as eight member federations converged in the city of Taichung in central western Taiwan. 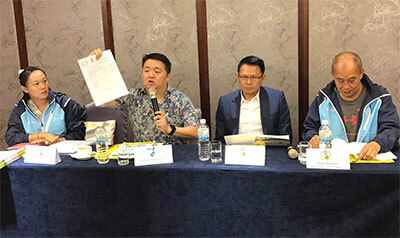 56 boys, 40 girls and 28 officials have been entered and confirmed during the team managers meeting held at the official Evergreen Laurel Hotel in downtown Taichung. Australia, Singapore and host, Chinese Taipei have two full teams of four boys and four girls. Japan and Macau have one team of four boys and four girls while Hong Kong and Saudi Arabia have fielded two boys team each. Team officials, who attended the meeting, chaired by tournament director, Dr Danny Santos finalised their teams line up. Mr Wu Fu-Lung, President of the Chinese Taipei Bowling Association, welcomed all officials on behalf of the tournament committee and thanked the teams for their support in sending teams to this championships, hosted for the first time in Taiwan and supported by Taichung City Government. Four events will be contested comprising of Singles, Doubles, Team of Four and Masters. The top 16 boys and top 16 girls in the All Events standings after 18 games played will qualify for the Round-Robin Matchplay Masters finals to be held over two blocks of eight games each. The top 3 boys and top 3 girls at the end of the Masters finals will advance to the stepladder shootout finals. The official practice is scheduled for tomorrow (October 1) followed by the official opening ceremony to be held at 28-lane Da Chung Brunswick bowling center thereafter. October 2 will kick off the championships with the Singles, followed by the Doubles on October 3. The Team of Four will be held on October 4 over two blocks of three games each while the Masters finals will be staged on October 7 and 8 culminating with the stepladder finals. There is also a whole day tour organised for the participating teams on Saturday, October 6. The victory banquet, to be hosted by Chinese Taipei Bowling Association, will conclude the week-long championships. Photos by Terence Yaw in Taichuing.  Form D - Media Accred.  Form G - Unofficial Prac.